Do you like handmade puppets, toy soldiers, ballerinas and dolls? Charming elderly toymaker Gabriel Hartwicke and his wife Hilary have the perfect play toys just for you! From celebrated cult filmmaker Stuart Gordon (Re-Animator), executive producer Charles Band, producer Brian Yuzna (Society) and screenwriter Ed Naha (Troll) comes a campy, horror cult classic that combines the pint-sized playmates of childhood with bone-chilling fun. The 1987 horror film Dolls Collector's Edition is a bloody good terror trap that delivers its frights, fun and fantastic effects in equal measure. The film stars Stephen Lee (The Pit and the Pendulum), Guy Rolfe (Puppet Master III, Mr. Sardonicus), Hilary Mason (Don't Look Now), Ian Patrick Williams (Re-Animator), Carolyn Purdy-Gordon (From Beyond), Cassie Stuart (The Hunchback), Bunty Bailey (Spellcaster) and introducing Carrie Lorraine (Poltergeist II: The Other Side) as Judy Bower. On November 11, 2014, SCREAM FACTORY(TM) is proud to present Dolls Collector's Edition Blu-ray on home entertainment shelves everywhere. Arriving for the first time on Blu-ray(TM), this highly anticipated release contains insightful bonus content, as well as a collectible cover featuring newly rendered retro-style artwork, a reversible cover wrap with original theatrical key art. 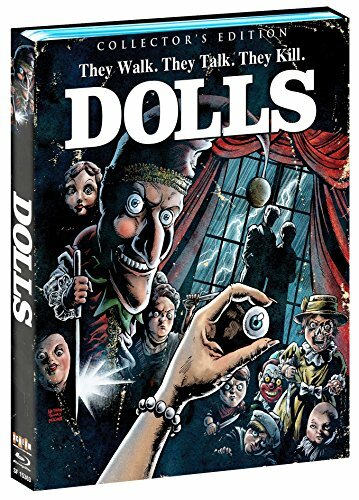 A must-have for horror enthusiasts, movie collectors and fans of Stuart Gordon, DOLLS Collector's Edition Blu-ray is priced to own at $29.93 SRP. ***Avid fans and collectors please take note: Order this title from ShoutFactory.com and receive an exclusive 18"x24" poster featuring our newly commissioned artwork, available while supplies last! Plus, it will ship THREE WEEKS EARLY on 10/21. A precocious girl, her nasty parents, two punk-rock losers and a weak-kneed salesman inadvertently become the guests of two ghoulish senior citizens in their dark, haunted mansion. The old couple makes and collects dolls that, when not sitting still like good little mannequins, creep around in the night, offing the guests one by one! You may laugh at first, but if they turn on you, you'll regret it...for the rest of your short life! * New SCREAM FACTORY bonus extra: Toys of Terror: The Making of "Dolls"
An all-new retrospective featuring interviews with director Stuart Gordon, producer Brian Yuzna, stars Carolyn Purdy-Gordon, Ian Patrick Williams, executive producer Charles Band, and special make-Up effects artists Gabe Bartalos, and John Vulich and more! or to view exclusive video content on YouTube (http://www.youtube.com/user/ScreamFactoryTV/Home).